in this section, the terms "cold" and "hot" refer to the temperature of the coils. "Cold" means approximately -10 to 50°c (14 to 122°f). "Hot" means approximately 50 to 100°c (122 to 212°f). If a dtc is present, perform troubleshooting in accordance with the procedure for that dtc. Remove the no. 1 Engine cover. Remove the bolt and ignition coil. Using a 16 mm spark plug wrench, remove the spark plug. 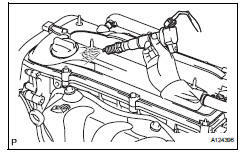 Disconnect the 4 fuel injector connectors. 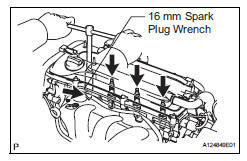 Install the spark plug into the ignition coil, and then connect the ignition coil connectors. Check that sparks occur at the spark plug while the engine is being cranked. Be sure to ground the spark plugs when checking them. If the ignition coil has been struck or dropped, replace it. Do not crank the engine for more than 2 seconds. If sparks do not occur, perform the spark test. Using a 16 mm plug wrench, install the spark plug. Install the ignition coil with the bolt. Connect the 4 fuel injector connectors. Install the no. 1 Engine cover. Check that the ignition coil connector is securely connected. Perform the spark test on each ignition coil. 1. Replace the ignition coil with a normal one. 2. Perform the spark test again. Check the power supply to the ignition coil. 1. 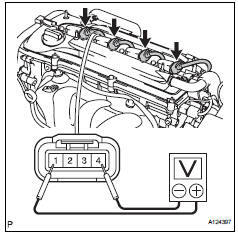 Disconnect the ignition coil connector. 3. Measure the voltage of the wire harness side connector. Check the resistance of the camshaft position sensor. Check the resistance of the crankshaft position sensor. Check the igt signal from the ecm. If a megohmmeter is not available, perform the following simple inspection instead. 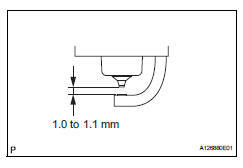 If the result is 10 mù or less, clean the plug and measure the resistance again. 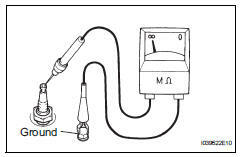 If the electrode is dry, the spark plug is functioning properly. If the electrode is damp, proceed to the next step. 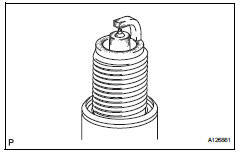 Check the spark plug for any damage on its threads and insulator. Only use the spark plug cleaner when the electrode is free of oil. If the electrode has traces of oil, use gasoline to clean off the oil before using the spark plug cleaner.